In this blog, I will try to share what I've learnt about this sport after spending hundreds of hours learning, experimenting (yes! ), competing and as well as training beginners in this sport. I've also watched many videos analyzing how the top players - especially those - competing in France (though not necessarily French!) - play their game. Their style of throw, shooting and game play during masterclass and other competitions. I know, starting out, it is difficult to get all information at once.... It is a bit like golf; the game is easy to understand and play, but mastering the finer points and skill seems to take a life time. Fortunately, petanque is not that complicated and doesn't require you to whack a tiny ball hundreds of yards into a small hole. Nonetheless, we are in awe of folks who can shoot and hit well, do high-lob pointing well, and generally just reach 13 points with relatively ease. Well, as you compete more, you'll realize there is more to the game than outpointing someone (especially when you are just starting out and haven't learnt how to shoot). In this blog, I will try to highlight all there is to know to play well - the progression from amateur to semi-professional. 1. Holding the Boule: Various grips explained. 2. Throwing the Boule: Again, various techniques will be discussed. 3. Shooting the Boule: How to do it, and with consistency. 4. Skill sets to learn and practice on. 5. Game Play and Tactics: Playing against amateurs and the pros. 6. Analysis of top players and recent masterclass plays. As much as possible, I will use my own thinking and approach. I am both an engineer and concept artist, so I think you will find my insights pretty interesting. Plus all these insights come not just from playing and competing, but from also from countless hours studying the game, top players and watching master-class competitions whenever videos of them are posted. For beginners, there are actually many resources out there, both in English and French. English is a welcome language as it is more familiar, say, in most int'l areas, esp Asia. Also, in America, interest in petanque is growing, as it is in the UK. A training video from that commonwealth of nations has just emerged this April. So, yes. 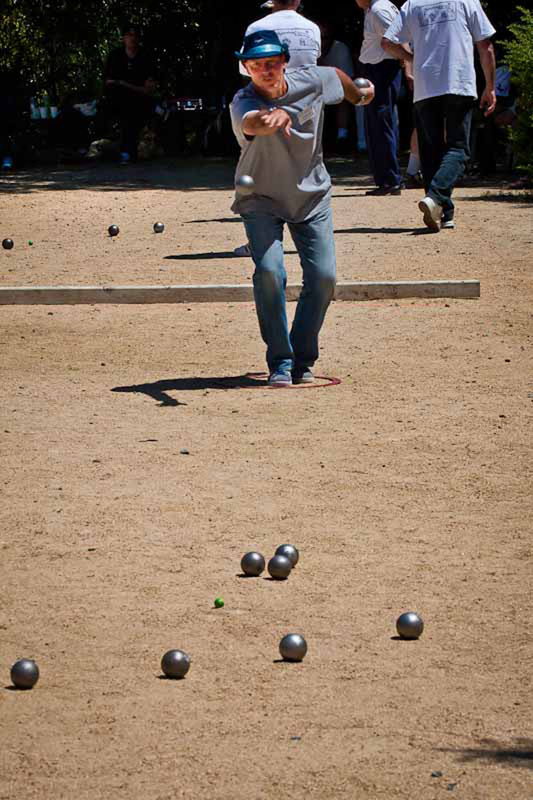 There are many resources out there online to learn the rules of petanque, choose a boule, etc. Also Youtube videos on everything petanque including "extreme petanquing" are out there also (haha), including regular postings of top competitions in HD (which is a good thing). I will include it all in a resource page and hope to keep adding to it as and when I come across any in the course of time and if my online schedule permits. (Actually this page is a revamped one form an old "all-in-one" page. It is easier to follow and allows easy amendment too (by subject). I play many sports well, esp those involving a ball. Badminton, tennis, table tennis, volleyball, golf, you name it. Even darts! Now I add petanque to the list. 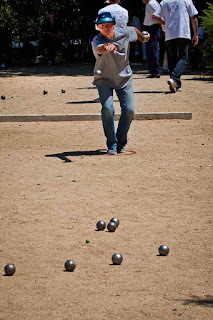 But most of all, I find petanque to be the most social. Besides darts, whcih other sport lets you drink and be pally on court? And it is a social game that can be played almost on any surface anywhere; and at any age. It is a very gentlemanly/lady-friendly game. Truly an equal opportunity sport. Lets keep it that way and encourage its take-up! I do hope by doing this blog, I am helping folks to play better and to better enjoy the game. If you have any comments, I welcome it. Hopefully I'll find time to write an instructional manual to help one and all explore this game to its fullest extent.